Hi, could you tell me how I get the wifi network? Did I miss the first part of the setup? Is there another video? Thanks! I recently changed my internet service and plugged my monitor up to view my calendar but when I moved the Dakboard to the desired room it would not come back on, I received a message saying “no signal”. I tried to go on line and I noticed my CPU looks different than the one on the website. The CPU that I have is not enclosed, it has a cover for the top but the side is not enclosed and there is not HDMI output. But other than that can you tell me what could be the problem for the no signal although I plugged it into the router? Please help I love my DAKboard. I’m not entirely sure why that’s not coming back on. Make sure you have the correct input selected by using the buttons on the side of the display. Other than that, I’d recommend contacting our support team at contact@dakboard.com. Please include your order number or serial number in the message and we can assist further. Thanks. 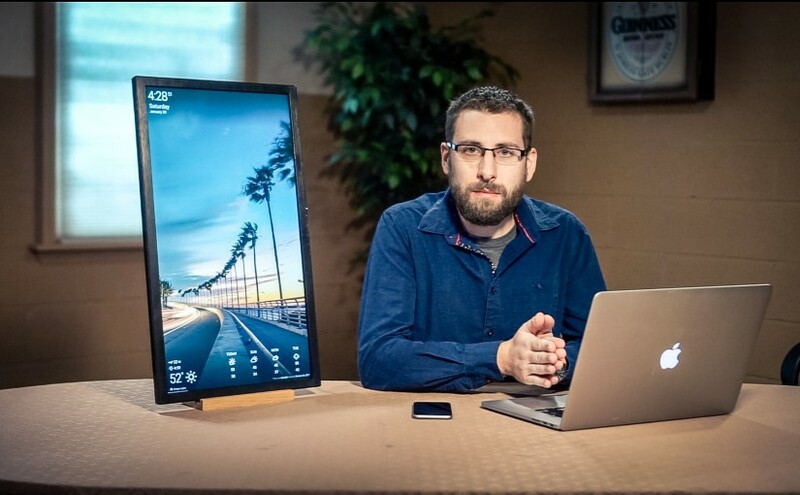 What is the brand of the wooden stand holding up the Dakboard? Hi Victor, that stand was something custom we made using some spare wood and a .25-inch dowel rod inserted into it perpendicularly to hold it up. Hi, sorry to hear about the issues. Please contact our support team at contact@dakboard.com and we can assist. Thanks! Next Next post: Announcing DAKboard Custom Layouts!